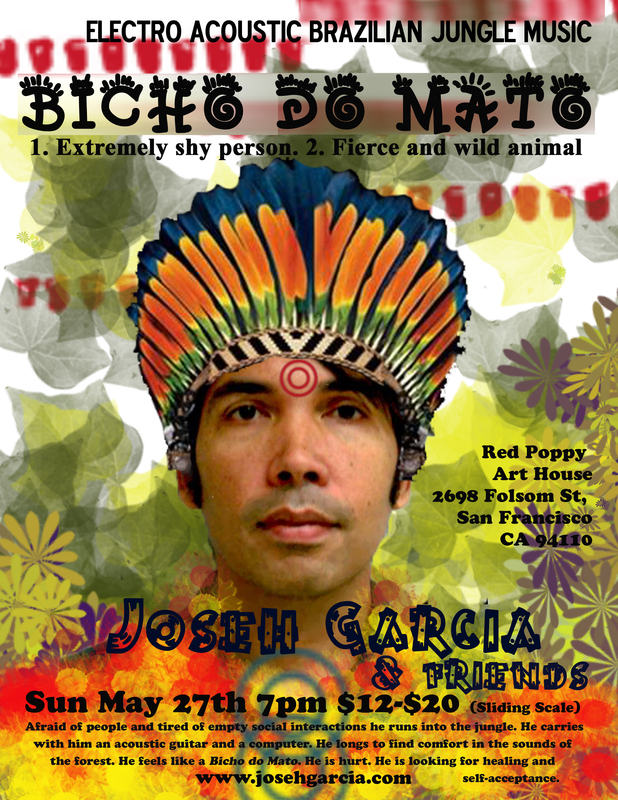 Bicho do Mato (Animal of the Jungle), a Brazilian expression used to describe an extremely shy person, is the title of my new show. I took inspiration from my solitude and my healing moments with Nature to create this wonderful event. In Bicho do Mato, I take you on a journey in which electronic and acoustic sounds meet popular music and afro-indigenous spiritual songs from Brazil. Introspection, wildlife, and magical deities of Amazonian life are the themes of the show. I sing, play acoustic guitar, create electronic sounds and wonderful guest musicians collaborate with their talents, such as the singer songwriters Alan Medeiros and Jim e Sparkle Pants, the flutist Dan Magay and pianist and flutist Dave Salvator and the visionary singer Silvia Nakkach. This will be my last performance in the Bay Area for 2012. Next stop is Canada, and then I am ready to take this new show to other corners of the world. Come and join us in this Musical Journey into the Amazon in search of Healing.! Afraid of people and tired of empty social interactions he runs into the jungle. He carries with him an acoustic guitar and a computer. He longs to find comfort in the sounds of the forest. He feels like a Bicho do Mato. He is hurt. He is looking for healing and self-acceptance. * Bicho do Mato: Portuguese expression used to describe an extremely shy person. This entry was posted in Brazilian Music, Healing Potential of Music, Transformative Musical Experience and tagged ", " Amazon", "Alan Medeiros", "Bicho do Mato", "Dan Magay", "Dave Salvator", "musical journey", "Red Poppy Art House", "search of healing", "Silvia Nakkach", "www.josehgarcia.com", Brazilian Music, Joseh Garcia, Live Music", MPB, San Francisco, transformative musical experience. Bookmark the permalink.